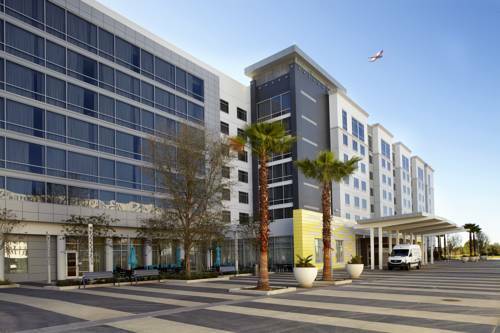 Among the newest Orlando hotels, the Residence Inn Orlando Lake Nona offers all of the comforts you desire and the ideal location less than 1 mile to the Lake Nona Town Center, 8 miles to Orlando International Airport and minutes to area hospitals like Nemours Children's Hospital and the VA Medical Center. This Orlando hotel provides easy highway access to Central Florida's themeparks like Walt Disney World, Universal Studios, and SeaWorld. We have perfected the extended-stay experience by blending superior service with great value that includes spacious apartment-style suites with full-size kitchens and living area. Kitchens include large refrigerator, microwave, dishwasher, stove, coffee maker, and more. Our hotel is perfect for staying 5+ nights or short-term stays. After a workout in our 24-Hour fitness center or a dip in our heated pool, start your day with free hot breakfast buffet. Stylish suites with free WiFi offer HDTVs with Netflix and Hulu. Our friendly staff looks forward to your stay!